If you're considering getting an active and intelligent dog with minimal grooming needs, consider the American Staffordshire Terrier. This athletic dog is known for their tenacity, friendliness, and love of family. American Staffordshire Terriers were developed from a mix of bulldogs and terriers brought to the Americas from England in the 1800s. The dogs were first created to bait bulls and engage in dog fights as well as to serve as working dogs on farms and general protection dogs. Over time, dog fighting fell out of favor with the public as more enlightened perceptions of animal welfare increased, and breeders wanted their dogs to shed the negative perception. The breed was renamed the Staffordshire Terrier in 1936 and was accepted by the prestigious American Kennel Club. The breed named added the word "American" in 1972. The Pit Bull Breed "Group"
Many people consider the American Staffordshire Terrier to be a pit bull. In fact, "pit bull" is not a breed but refers to a collection of breeds with similar ancestry and physical characteristics. 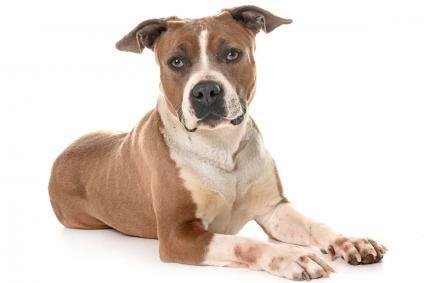 This includes the American Staffordshire Terrier, American Pit Bull Terrier (APBT), and the Staffordshire Bull Terrier. The American Bulldog is often considered part of the pit bull group although not everyone agrees on this inclusion. 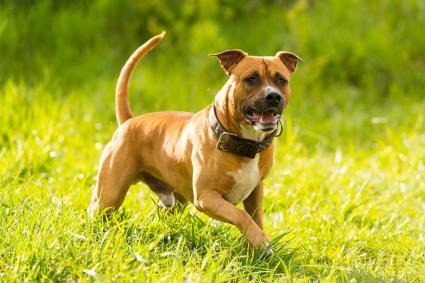 The American Staffordshire Terrier and APBT have the same origins, but each breed eventually was established with some differences from the other. The American Staffordshire Terrier is about 40 to 60 pounds whereas APBTs are on average 85 pounds. The American Staffordshire Terrier is a recognized breed by the American Kennel Club (AKC). The American Pit Bull Terrier is recognized by the United Kennel Club (UKC) and the American Dog Breeder's Association (ADBA). The UKC allows dogs to be registered as both breeds, but the AKC does not. Once the American Staffordshire Terrier was recognized by the AKC, breeders began to focus on different qualities from the APBT and looked to create a "show dog" with less dog aggression, or "gameness," found in APBTs at the time. 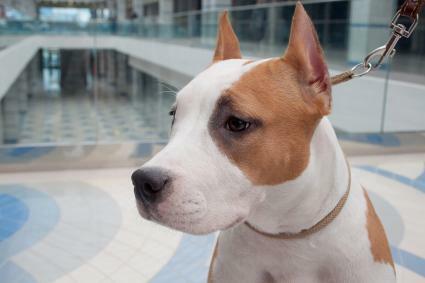 A number of breeds of dogs have been bred to American Staffordshire Terriers to create new cross-breeds. Some typical mixes include the American Bull Staffy (crossed with an American Bulldog) and the Frenchie Staff (crossed with a French Bulldog). American Staffordshire Terriers have an average lifespan of 12 to 14 years. They have a short coat that needs just a brushing once a week. The breed has a stocky and muscular frame and rose-shaped ears, although many breeders crop the ears. They come in most colors, both solid and mixed, with patches of white. The brindle coat pattern is also common in the breed. 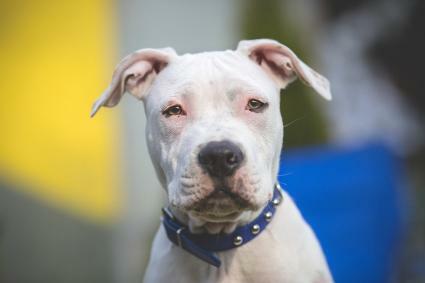 Being that the American Staffordshire Terrier is considered part of the "pit bull" group, the breed suffers from the negative image of pit bulls in the media. In fact, the American Temperament Test Society tested multiple individual dogs for 200 different breeds of dogs, and dogs in the pit bull group tested higher than many other breeds. They landed in the mid to high 80 percentile in 2017, which is higher than many other popular breeds. A well-bred American Staffordshire Terrier is known to be a friendly dog that loves people and is very intelligent and active. They tend to love children and were once known as "nanny dogs" in their early history. A good example is Petey the lovable dog from the Little Rascals television show which was one of the first APBTs to be recognized by the AKC as an American Staffordshire Terrier. They may have a tendency toward dog-to-dog aggression though due to their terrier nature, but breeders have worked to select for dogs without this behavior trait. Many American Staffordshire Terriers live successfully with other dogs, cats, and small pets. 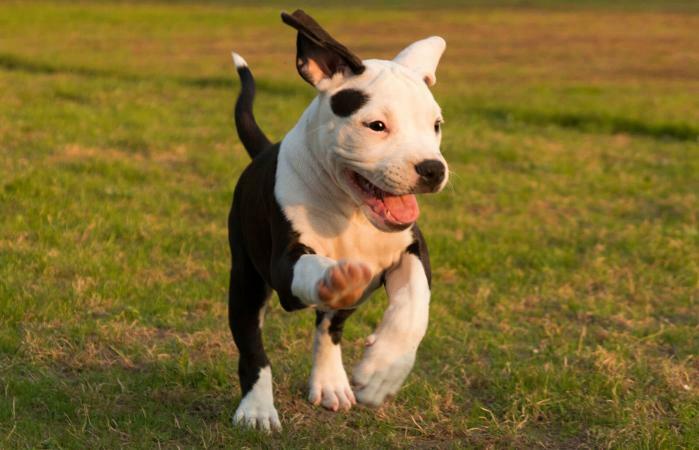 Because American Staffordshire Terriers are a strong and athletic dog, daily exercise and walks are a must to keep this breed happy. Dogs that don't get enough exercise can become bored and destructive. Providing them with ample appropriate chew items will also help them exercise their strong jaws. Early socialization is a must for this breed. Any American Staffordshire Terrier owner can confirm you will face trepidation from people uncomfortable with the breed due to negative stories in the media. It is necessary to keep your American Staffordshire Terrier well-socialized and comfortable with people and other animals. Likewise, training at least the fundamentals of obedience will help you live harmoniously with this large, strong dog. American Staffordshire Terriers excel at most dog sports, including agility, parkour, weight pull, and Rally. They are extremely versatile, and one can find examples of the breed working as therapy dogs, service dogs, and detection dogs. If you want to find a purebred puppy, the AKC website lists breeders with AKC-registered litters, and the Staffordshire Terrier Club of America has a breeder directory on their website. If you're looking to rescue an American Staffordshire Terrier, you can find dogs local to you using the Petfinder website and Pit Bull Rescue Central. Is This Breed the Right Dog for You? If you're interested in bringing home an American Staffordshire Terrier, research the breed carefully and talk to knowledgeable breeders and rescue groups to help make an informed decision about the needs and benefits of this powerful and intelligent breed.